Material emissivity measurements at extreme conditions can provide fundamentally important data that allow the measurement of temperature on short time scales, which is crucial for the complete characterization of dynamic compression events. For opaque materials such as metals, reflectivity measurements are necessary and must be conducted under dynamic compression in order to provide the necessary information. 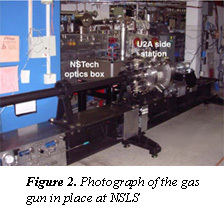 In October 2006 a team led by Dan Dolan from Sandia National Laboratories achieved an important milestone when they were able to couple broadband synchrotron IR radiation from the CDAC-supported NSLS U2A beamline to characterize the emissivity of a copper film under shock compression. 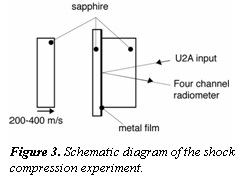 The time structure of the pulsed synchrotron radiation is ideal for monitoring shock compression events. 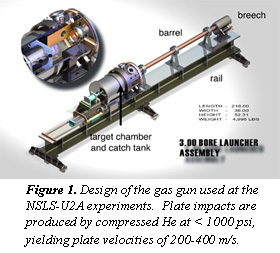 A gas gun utilizing compressed helium for plate impact experiments (Figs. 1, 2 and 3) at up to 400 m/s was constructed and moved to the floor of the NSLS VUV-IR ring, where infrared radiation from U2A was used provide IR radiation for reflectivity measurements. In the first part of the experiment, light from the visible-ultraviolet ring was routed out of the U2A hutch, and focused onto a InGaAs detector after beam conditioning. 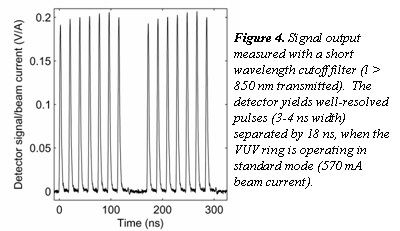 The detector output from the InGaAs photodiode is shown in Fig. 4, and shows cleanly resolved 3-4 ns pulses separated by approximately 18 ns, indicating that real-time infrared reflectance measurements are feasible. For reflectivity measurements, the IR beam from U2A was diverted upstream and focused directly on the gas gun. Measurements on copper films show that metals tend to become slightly less reflective when shocked, and that the assumption that metals are slightly more emissive under dynamic compression is in fact justified. Another key finding is that the low-reflectance metallic films needed for dynamic pyrometry measurements do not fail when becoming highly reflective under shock compression. The work carried out by the Sandia team also opens up new possibilities for using synchrotron x-rays to study time-resolved diffraction of solids under shock compression and isentropic compression conditions.